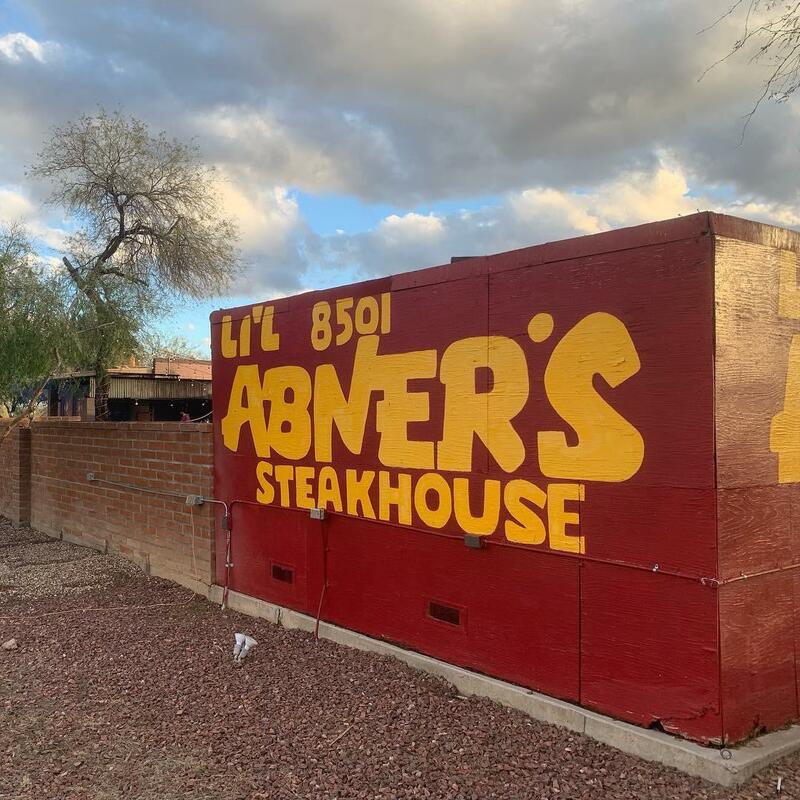 Last night we celebrated Ed's birthday at Li'l Abner's Steakhouse - a restaurant that's been in Tucson, serving Mesquite grilled steak, ribs, and chicken, since 1947. 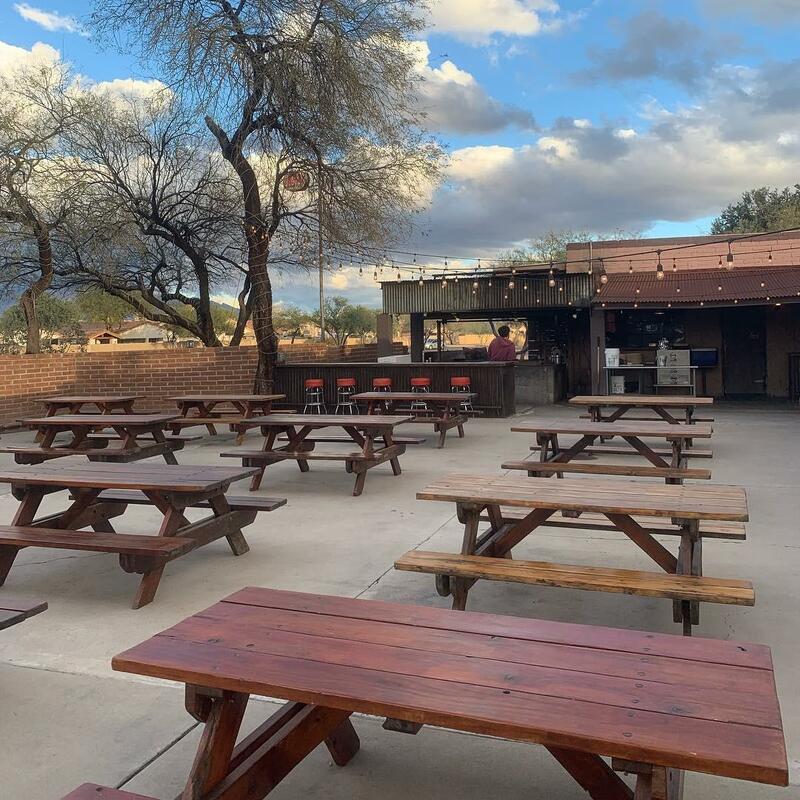 When I first visited Tucson in 1980, my parent's friends took us here. It was the place to go. I hadn't been back since then. Back then, it was soooooo far from our house, in the middle of nowhere, the only place for miles. I've heard rumors over the years that it closed, but because it was a bit of a drive from our house, it wasn't a place I ever considered going so I didn't pay much attention to its status. But lately we've been talking about checking it out and since Ed loves steak, I thought it would be a good time to visit again. 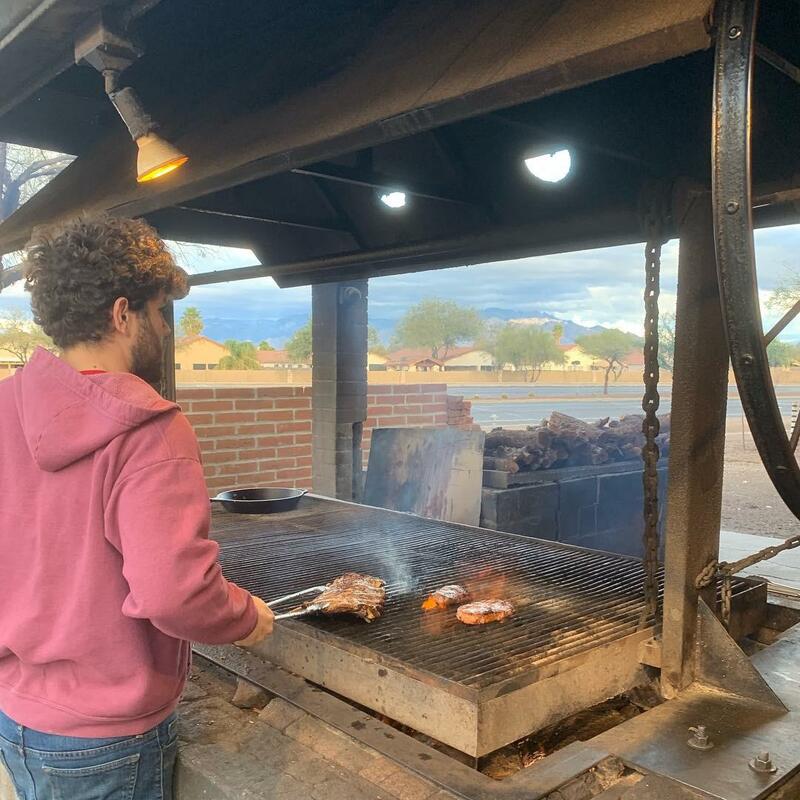 They cook all the grilled items on a big, outdoor grill over an open Mesquite fire. It's a very casual place. The building sits on a dirt lot, now on the side of a busy road since everything has been built up out there over the past 35+ years. They're only open 5 p.m. to 9 p.m. on the weekdays and 5 p.m. to 10 p.m. on the weekends. I don't remember anything about the place. It's a very casual place with checkered tablecloths, plastic plates, paper napkins, etc. Intentional graffiti, photographs, bottles, and license plates lined the walls and ceilings. The interior was dark and rustic. 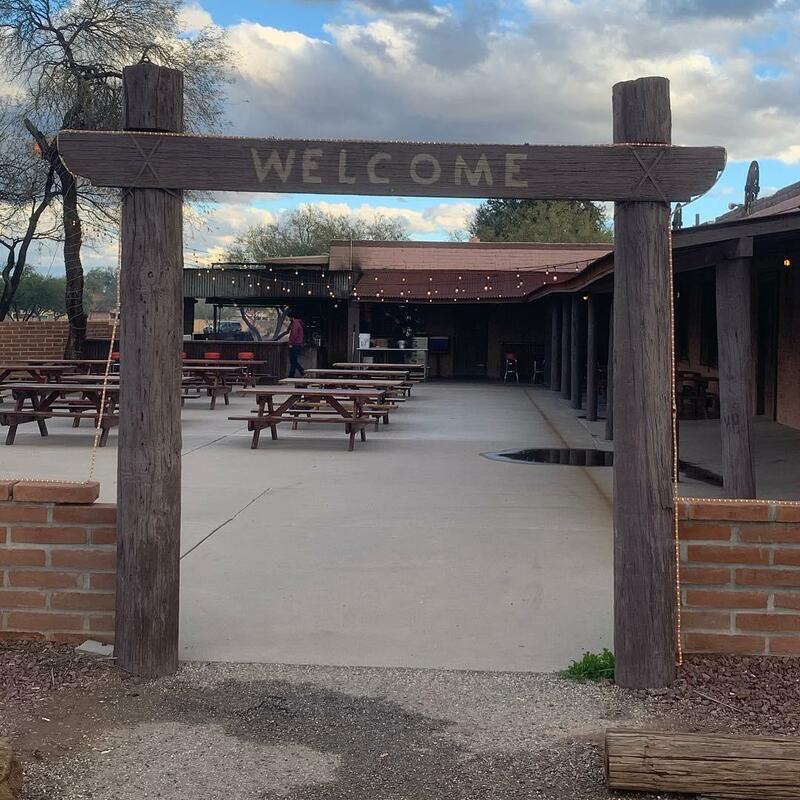 All main courses are served with all you can eat family style sides (Ranch Beans, Garlic Toast, Salsa, and one dinner salad per person). My mother and my friend Kim joined us. 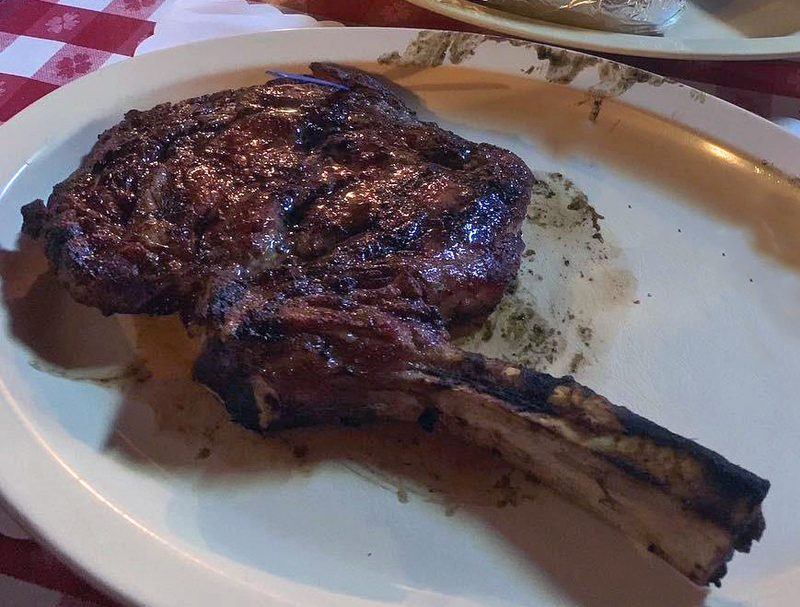 Ed went big, opting for the "The Cowboy", a 2-pound Porterhouse ($44.95) - he took a doggie bag home with what he couldn't finish. I had the 16-ounce bone-in Ribeye in the photo above ($39.95), my mother had a 12-ounce Boneless Ribeye ($29.95), and my friend Kim had the Half-Pound Harris Ranch Cheeseburger ($12.00). Us steak eaters added a baked potato ($4.00 each) and Kim chose Potato Wedges ($5.00) for her side. The steak was delicious. So flavorful, tender, and grilled to perfection. It was a little pricey but definitely worth it for a birthday dinner. With drinks, tax, and tip it came to just under $200.00. I'd definitely consider going back - it was much better than the pricey steakhouse we went to for my birthday a couple of years ago. Although, I did like the decor at that place much more. I'm glad to know this restaurant is still in existence. 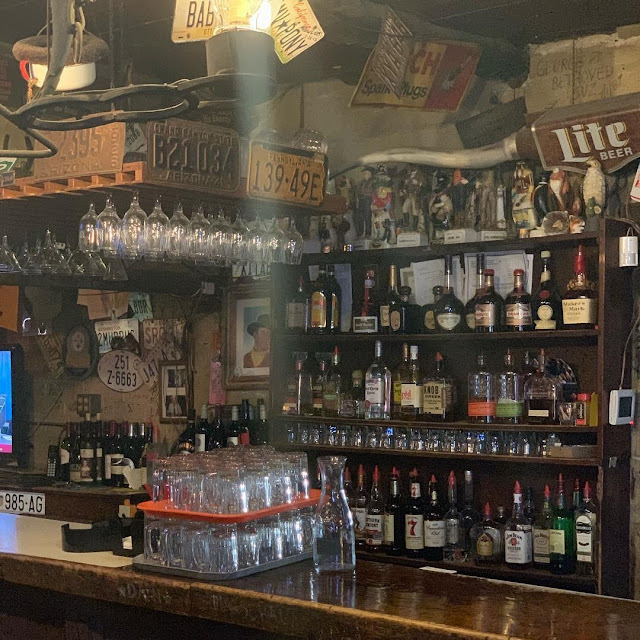 The restaurant business is always risky and it's unusual for restaurants in this town to have this kind of staying power. We arrived at 5:15 p.m. and were seated promptly. It didn't take long for the place to fill up. On a Wednesday night. That's a pretty good sign. Tucson's a few notches up from Dogpatch, USA.